How can you explain the difference between a backup and a replica? I know that even with lots of available information, some confusion still comes up. Let's remove the misconceptions and discuss the VMware VM replication process with Veeam. Replicating a VMware virtual machine means creating a “twin” of the production virtual machine on a remote site in a ready-to-use state. Native VMDK file is stored uncompressed together with the VMX configuration file already registered in the target virtual environment, so you can immediately power on the required VM on demand. Whenever you have problems, and whatever those problems you might have with your production application, you can always start its replica in just a few seconds from another location. In comparison with backup, replication shows faster recoverability and very quick recovery time objectives (RTOs) because instead of restoring data from the backup and registering the VM, you simply need to power-on a spare clone of a failed VM. Additionally, replicated VMs are flexible in handling since they can be used on the same site to accommodate a SAN failure or even off-site to accommodate a site-wide outage. Veeam Backup & Replication (a part of Veeam Availability Suite) performs both backup and replication for VMware and Hyper-V, so you get a 2-in-1 solution. It performs image-based replication with compression, deduplication and changed block tracking (CBT) technologies, which reduce traffic and speed up data transfer. With Veeam Backup & Replication, you can replicate faster while reducing bandwidth consumption with Built-in WAN Acceleration, replicate from backup files, use Failover Plans with 1-click site failover and facilitate your data center migrations employing Veeam's Planned Failover feature. Replication with Veeam may also serve as a “life hack” for a seamless VM migration and upgrade across clusters. Veeam supports VMware vSphere 4.x and higher, including the latest 6.0 release (get Update 2 for Veeam Backup & Replication v8 if you missed it somehow). Using replication you can, for instance, upgrade vSphere 5.1 to vSphere 6.0 and safely migrate your virtual machines from the ESXi 5.1 to the ESXi 6.0 host. The hidden benefit of doing a replication failover to the vSphere 6.0 environment is that you still have the older virtual machines in place in case the upgrade doesn't go as you expect. 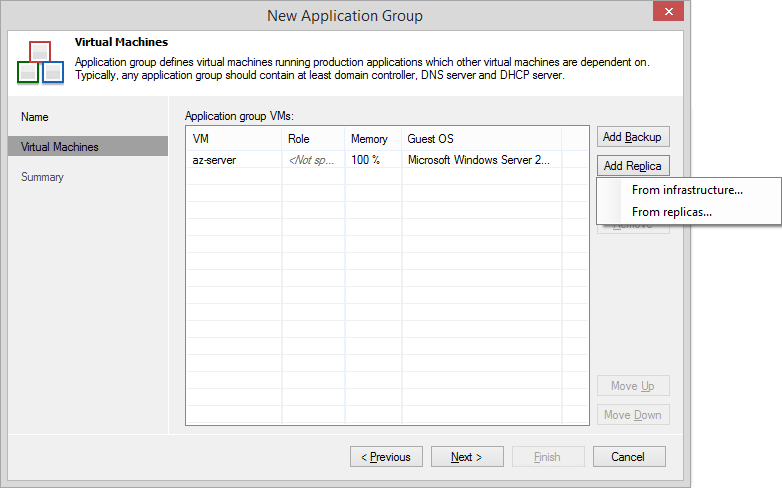 How does Veeam's replication for VMware VMs work? In many ways, the mechanism of Veeam's replication is similar to forward incremental backup. During the first job run, Veeam Backup & Replication creates a full virtual machine copy and then catches only the VM changes during subsequent job runs. Each replica has a number of restore points (like backup increments) which work as restore points for failover. You can configure up to 28 replica failover points with a Veeam replication job. Replication traffic floats block-by-block through a data pipe organized between the source and target hosts by means of Veeam's transport services. How to validate VM replicas? I'm sure you know what the SureBackup feature is. SureReplica technology does the same for replicas. Veeam Backup & Replication allows you to check every created VMware replica for recoverability without any manual work from you and right after your VM replica restore points are ready. When performing a SureReplica job, Veeam Backup & Replication validates replicated data for consistency, checks its configuration accuracy and tests replica for complete reliability by running it to the required restore point in an isolated virtual lab. In fact, SureReplica works very similar to SureBackup. Via the same GUI in Veeam Backup & Replication, you create a Virtual Lab, an Application Group and configure a familiar SureBackup job, but you add a VMware VM replica instead of a backup. Finally, I would like to discuss Veeam Backup & Replication licensing and dismiss one of the most common misconceptions. Do you need a Veeam license for your DR site and ESXi hosts to perform remote VMware replication? The answer is NO. You don't need to license your DR hosts. Veeam has a straightforward per-socket-licensing model and you only need to install licenses on your source-side vSphere hosts. The only exception where you will need the Veeam Backup & Replication licenses for both the production and DR sites here is when your target host is running VMs that you are also backing up or replicating. Now you see how easy you can start replicating your critical VMs with Veeam. In my next post, I'm going to dive a bit deeper and focus on ways of optimizing replication traffic. Stay tuned to Veeam! And if you are interested in any particular use case or some tips and tricks, please leave your feedback and ideas here, and I'll cover the topic in my next posts.